Sessions slams liberal colleges for fostering "sanctimonious, sensitive snowflakes"
Attorney General Jeff Sessions made light of some therapy practices on college campuses across the country, and accused some liberal universities of creating a generation of "snowflakes." While delivering remarks to Turning Point USA's High School Leadership summit, a right-wing non-profit organization, Sessions said that "far too many schools are complicit" in cracking down on students' First Amendment rights, preventing "genuine debate" to play out on the college campus. "Whether you realize it or not, freedom of thought and speech on the American campus are under attack," Sessions warned. Sessions cited "safe spaces," art therapy (a platform issue recently taken up by Vice President Mike Pence's wife Karen Pence) optional exams and therapy animals on campuses as "coddling" young people and preventing them from "scrutinizing the validity of their beliefs on the issue of the day." "After the 2016 election, for example, they held a 'cry-in' at Cornell -- I hope they had plenty of tissues for them to cry on. They had therapy dogs on campus at the University of Kansas, and Play-Doh and coloring books at the great University of Michigan, for heaven's sake. I thought that was...you know, give me a break! Students at Tufts were encouraged to 'draw about their feelings.'" With such practices, Sessions said, schools are doing "everything they can to create a generation of sanctimonious, sensitive, supercilious snowflakes." He called it a "disservice" to the students and nation alike. Therapy dogs have been deployed to numerous schools across the country not only to alleviate their anxieties, but also for comfort after tragedy. Therapy dogs were sent in the wake of the deadly Parkland school shooting in Florida this past year, and they were also used after the Sandy Hook and Virginia Tech shootings. 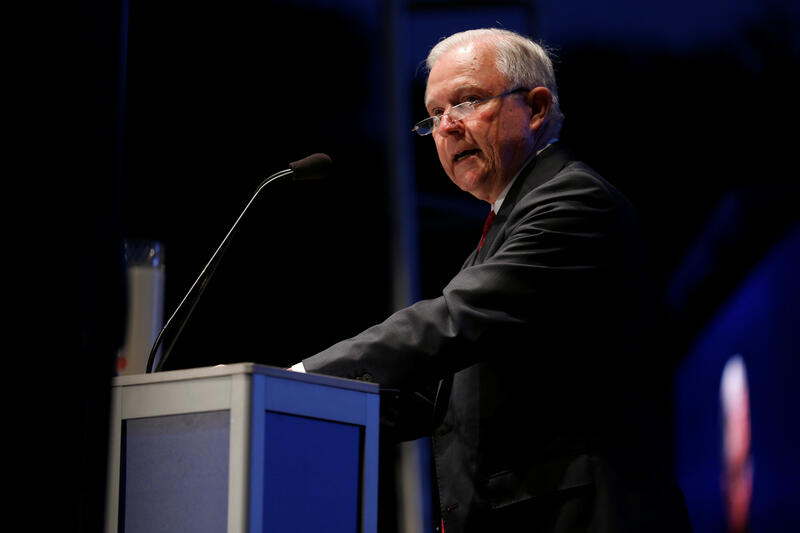 Sessions' comments drew frequent applause and laughter from the student crowd, and even chants of "lock her up" at one point, a common refrain made during Trump rallies throughout the 2016 campaign. Sessions repeated "lock her up" once and laughed, recalling that he had heard the chant a lot during the presidential campaign. Sessions is recused from any matters related to Hillary Clinton's emails. "Well, I can tell this group isn't going to have to have Play-Doh when you get attacked in college and you get involved in a debate, you got to stand up, defend yourselves and the values that you believe in," Sessions said. "I like this bunch, I got to tell you -- you're not going to be backing down, go get 'em!" He explained to the crowd he had heard the chant "a long time over the last campaign." Critics of Sessions have previously slammed his remarks on free speech at college campuses as hypocritical, since the administration and President Trump favor punishing others -- like NFL players -- for exercising their right to free speech.